He’s an 11 week old English Staffy. 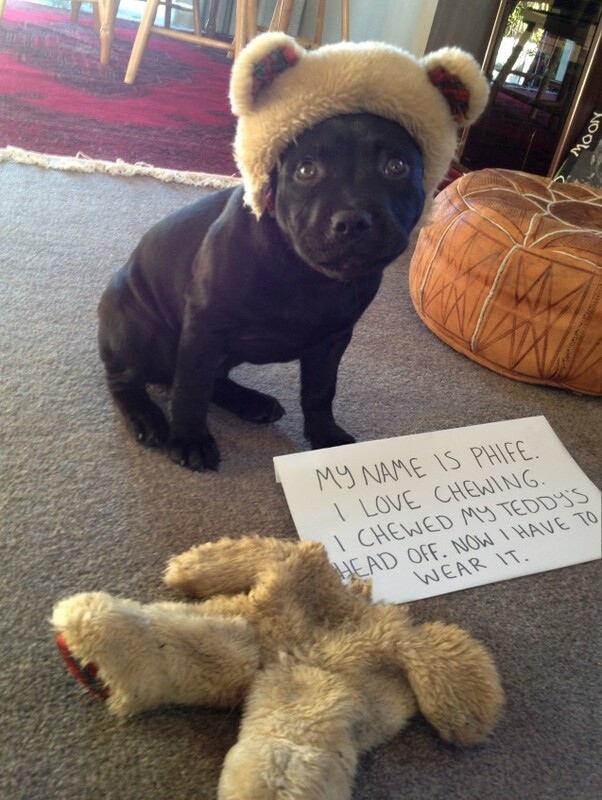 And like all staffies he loves to chew. Everything. Posted June 17th, 2014 . Aw, he’s not naughty, he’s just being a puppy. He’s adorable. Can’t be angry with that sweet face!! Named after an MC, good job! I just love this picture and the look on his face that you caught. So cute. “Uh oh, this can’t be good”, or “This is going to be embarrassing” ? Just shame and “bear” it. I am sure Coco Channel started out just like me! He’s my pup. He’s a really good boy, but every now and then he’ll have a chew-a-thon. The latest victim was my reading glasses.